All the benefits of the MP1K but with an additional housing supplying an increase in flow rate and capacity, and therefore a longer replacement cartridge period. The twin cartridge assembly means that the filter properties may be varied to suit individual needs and preferences, for example for additional hardness (inorganic calcium) removal. The first cartridge as in the MP1K uses a ceramic membrane and a series of inner granular form water treatment media. The second removes more water pollutants. Drinking unfiltered tap water has been scientifically shown to turn essential nutrients into toxic chemicals and it is essential for your health regime to drink sufficient quantities of pure water every day.Water makes a vital contribution to your overall health, fitness and life expectancy and plays a role in nearly every bodily function.Many of us are chronically dehydrated without even realising and this has been shown to be a factor in many degenerative diseases. Bottled water is used widely to avoid the health risks of tap water, but European standards for bottled water are actually lower than those for tap water in the UK! Aluminium sulphate, chlorine and fluoride are added deliberately at the waterworks - numerous studies have linked these substances to a variety of health conditions.However our tap water is exposed to even more toxic substances in its journey to our taps - studies have reported up to 700 different contaminants in our drinking water including fertilisers, chlorine, fluoride, antibiotics, nitrates and an array of harmful bacteria.Water filters are the only way to avoid exposure to such chemicals and offer a cost effective alternative. Daily washing with chlorinated water causes a high level of absorption of chlorine into the blood, and can be as much as one would absorb by drinking chlorinated water. To protect against this it is advisable to use a separate shower filter. Imagine the benefits of having purified water straight from your tap - giving you the freedom and convenience to drink, wash and cook with pure water at very little cost. Both water filters are easy to fit with basic DIY skills - full installation instructions are provided. This system has all the benefits of the MP1K but with an additional housing giving a higher flow rate and capacity and a longer replacement cartridge period.Delivers up to 4 litres of pure fresh water per minute. Stage 1: A ceramic barrier filters 99.99% of all particles larger than one micron (not visible to the naked eye). This includes bacteria, parasites, metals, organic matter and other chemicals. As deposits accumulate on the filter's outer surface, they can be easily removed, allowing the cartridge to be re-used again and again. Stage 2: A premium grade Granular Activated Carbon filler eliminates organic pollutants such as agricultural pesticides and herbicides. Silver impregnation reduces the build-up of any remaining bacteria. Stage 3: A different type of Carbon filter removes chlorine and improves taste and smell. Silver impregnation provides a second barrier to bacteria. 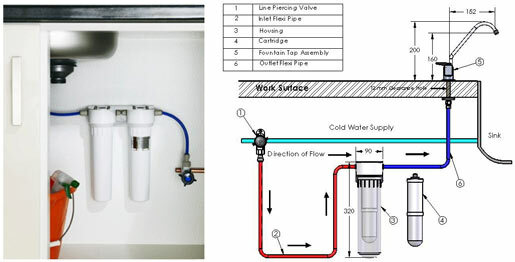 Stage 4: Special flow baffles improve the efficiency of the filtration process. Stage 5: This ion exchange resin takes out dissolved metals such as cadmium, lead, copper and mercury. Stage 6: A pure polypropylene layer prevents the escape of any carbon or resin particles. How does the MPIK system work? a) An outer shell of microporous ceramic that removes harmful bacteria, protozoa cysts and all particles above 0.9 (microns). The ceramic element is proven to remove 99.99% of particles between 0.6 - 0.7 (microns). For comparative purposes a red blood cell is approximately 5 (microns) in size while the lower field of human vision is estimated at 20. 1) Question: What does the filter remove? Answer: The 'Fountain' removes a broad range of contaminants from water. Contaminants found in water can essentially be placed in three different categories - microbiological, chemical & aesthetic. Impurities within these categories that are removed by the Pearl filter include - harmful bacteria, protozoa organisms, chlorine, trihalomethanes, volatile organic chemicals (VOC), synthetic organic chemicals (SOC), foul tastes & odours, rust particles, sediment, aluminium sulphate and numerous other undesirable elements including dissolved and particulate metals. 2) Question: What does the filter leave in the water? Answer: The ‘Fountain' is designed to remove virtually all harmful contaminants from water while leaving minerals essential to good health and taste intact. Calcium for example contributes to the overall taste of drinking water, is a major component of bones and teeth and is essential for various bodily processes such as blood clotting. The minimum required concentration of calcium in drinking water has been set by the EEC at 60 mg per litre. While some products such as distillers and reverse osmosis systems remove calcium and other beneficial elements, the ‘Fountain' system has been designed to remove only harmful contaminants while leaving in essential minerals. 3) Question: Will there be a noticeable difference in the quality of water from the filtered supply? Answer: Yes. Most people immediately notice a significant difference in the overall quality of purified water when they install a ‘Fountain' system. The extent of this depends largely on the level of contaminants in the water and individual sensory thresholds. Most complaints relating to the taste and odour of tap water are due to the presence of chlorine. As the system also removes wide range of impurities and contaminants, people often notice a marked improvement in the clarity and taste of the purified water. Pure water enhances the flavour of tea, coffee, soups and cooking in general. 4) Question: How does the ‘Fountain' system work? a) An outer shell of microporous ceramic that removes harmful bacteria, protozoa cysts and all particles above 0.9µ (micron). The ceramic element is proven to remove 99.99% of particles between 0.6 - 0.7µ (micron). For comparative purposes a red blood cell is approximately 5µ (microns) in size while the lower field of human vision is estimated at 20µ. d) Another type of premium grade coconut G.A.C e) Selective ion exchange resin to especially remove dissolved heavy metals such as lead, copper, cadmium and mercury. f) A pure polypropylene sinter to prevent escape of any filtration media. After purification the water continues through its own separate channel and is dispensed via a dedicated or three way tap. Answer: After six months use the filtration media begins to lose its effectiveness, usually coinciding with a significant decrease in the pure water flow as the ceramic outer section begins to clog with contaminants. We will automatically contact you via email or traditional post to let you know when the filter is due to be replaced. 8) Question: Does the ‘Fountain' require the use of chemicals or electricity? 9) Question: What is the operating pressure of the ‘Fountain' system? Answer: On normal water pressure the average flow rate of the pure water supply can go up to around 3 litres per minute. For optimum chemical removal performance, the service valve can be adjusted to provide a flow rate of around 1.5 litres per minute. Answer: The purifier should never be subjected to freezing temperatures as this can damage the unit. Damage can also occur if the purifier is connected to a hot water supply. 12) Question: Does the ‘Fountain' system soften water? Answer: No. The ‘Fountain' is not a water softener but can be used in conjunction with a household softener thereby supplying hot soft water, cold soft water and hard pure drinking water. Hard water is good for drinking while soft water is beneficial for bathing and other uses that do not involve the actual consumption of water. 13) Question: Do I need to purchase a separate purifier for the water dispenser in my American style fridge or for my instant hot water unit? 14) Question: Will the purifier stop my kettle from scaling up? Answer: To a degree the answer is yes, though this reduction will be limited and depends on the overall chemistry of the water. The ‘Fountain' is not a water softener, and unlike some filters, does not remove the minerals essential to good health and taste. Calcium and magnesium, perhaps the most essential of these minerals, are the cause of scaling. Some contaminants combine with these minerals and by removing the contaminants the scaling effect can be reduced. When water is boiled, some of the temporary hardness (in the form of calcium carbonate) precipitates into the water. In extreme cases this results in the appearance of white flecks in the boiled water or as a surface film on tea and coffee. A convenient remedy for this problem is to use one of the new generation of kettles now available. These kettles incorporate a fine mesh screen that remove the precipitate but not the dissolved minerals, thereby complementing the use of the ‘Fountain' system. 15) Question: How do I clean the tap without damaging the finish? 16) Question: Does the ‘Fountain' system remove nitrates? Answer: The ‘Fountain' system is not designed to remove nitrates and while it will remove a certain percentage, this can be regarded as accidental. The actual amount removed depends on whether or not any of the nitrate present is organically bound. However the FW2000 can incorporate a second cartridge for special needs such as the removal of nitrates. 17) Question: Will the ‘Fountain' fit a sink with a standard size hole? Answer: Yes. The base of the ‘Fountain' tap conforms with European standards relating to the diameter of the tap base and the diameter of the fixing hole. 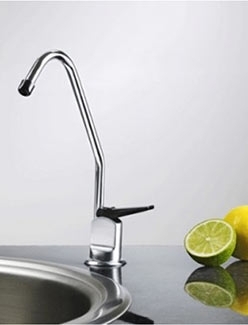 The thread size of our standard tap is only 12mm so an additional drinking tap on any work surface or in the corner of any sink is very easy to install. 18) Question: I have heard that water filters breed bacteria, is this true? Answer: Yes, but it does not apply to the ‘Fountain' system. Certain carbon filters have in fact been criticised for their ability to breed bacteria. However, in fairness to the manufacturers of these, the situation has been widely exaggerated and only applies to heterotrophic opportunistic bacteria. By comparison the ceramic shell of the 1000X-25-SM cartridge was originally developed for its bacteriological removal capability.